The oxymoron on the table. The name "Artificial Reality" lost out in the marketplace to the term "Virtual Reality." The model designation of the long-standing defacto standard viewing system optics for the VR industry. Created by LEEP Systems/Pop-Optix Labs. A blending of virtual computer-generated images with the realtime real-world images. Augmented Reality usually involves a display that allows light through from the real world. AR has been touted as a powerful tool that allows architects, soldiers, and the like to overlay schematics, radar, and other data on top of their normal sight. The abbreviation, AR, originally stood for "Artificial Reality." This made using the abbrevation somewhat ambiguous. Now AR for Artificial Reality has fallen out of use. Like stereo sound, but recorded with two microphones in the ear canals of a dummy head with pinnae and listened to only through headphones. Binaural sound gives the eerie effect of being in the place where the sound was recorded — without the need for corresponding visual imagery. Coined by LEEP Systems to denote regions of the visual field that are "behind the edge" of the entrance pupil of an HMD lens system, but which can be perceived if the eye axis is aligned with the optical axis of the lens system. Refraction at the cornea surface provides a vantage point about 1/2 inch closer to the eye lens than the center of the eyeball, hence a wider cone of view. Our coinage and trademark for what we mount on your face so that you may interface with Cyberspace to experience Virtual Reality or Telepresence. Coined by Professor Norbert Wiener for his book of that title in 1948. From the Greek for "steersman," he defined it in a subtitle as "control and communication in the animal and the machine." He would have become dyspeptic at some of the uses of his word in the last 50 years, but not, we think, with Cyberspace. He would note, however, that the loop has to be closed; that it isn't cyber-anything if the user can't interact with the space. Coined by William Gibson in his prescient novel, Neuromancer. Cyberspace is the datascape of 1's and 0's that comprises all artificial worlds. By immersing a person in Cyberspace, we create Virtual Reality. A complexity. The visual area, measured in degrees, that an eye or eyes can perceive. Of the eye itself we speak of the direct field and the peripheral field. The direct field is the solid cone swept out by the axis of the eye as it rotates in its socket — usually about 90 degrees except where the nose and the brows interfere. The peripheral field is everything that lies beyond the direct field — perceivable because of refraction at the cornea and usually about 270 degrees laterally for healthy eyes. Traditional moving pictures project a portion of the spherical FOV onto a small flat surface. The narrow viewing field breaks the illusion of reality and severely limits the amount of potential information that can be displayed. A viewing system that mounts on and moves with the head. 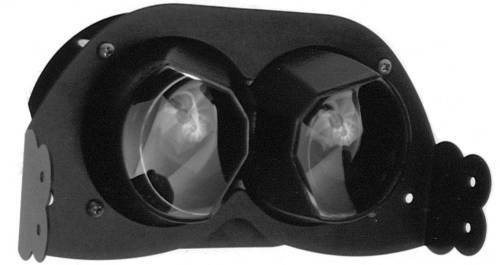 An HMD typically provides an image filling at least the direct FOV. Most HMDs have the ability to provide an image that changes according to the wearer's head movement in such a way that the surroundings appear to remain stationary. This facility is called Head Tracking. A means for controlling the user's view direction in the virtual world. 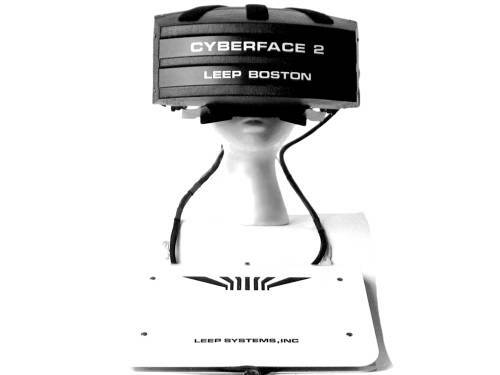 By interpreting the data of the user's head position, a display interface can simulate looking around in Cyberspace. The increased field of view yielded by viewing a scene indirectly. Coined by Eric Howlett to describe his new invention. When he was looking for a name, his wife mentioned that the lenses make things "really leap out at you." Thus, LEEP became the acronym (post facto) for Large Expanse Extra perspective. The compression the LEEP system applies to the angle of the view in an object space (Otherworld) to a radial distance on a flat medium (eg. an LCD) approximately proportional to the sine of the angle. Doing so permits economy in data storage and channel capacity and makes it possible to design a very wide-angle, high-powered magnifier. Originally known as Pop-Optix Labs, the creators of high-end ARV-1 and Videowrap. The first LEEP Systems/Pop-Optix Labs customer who started it all back in 1985. See also VPL, IMAX, IBM, UNC, DCIEM, MIT, AFIT, who have all used our optics or systems. A visual display system in which otherworlds are rendered with straight lines straight and correct perspective in every direction. In orthospace, the angles, sizes, and shapes in the virtual world are undistorted. Real-object or computer-generated spaces that are remote in time, place, or existence. Otherworlds can include exotic locations on earth as well as Cyberspace games or simulations, combinations thereof, and anything else we can imagine. Our coinage. We need this term because we serve all of its varying aspects. A perceived difference in the direction of an object, caused by a change in observational position that provides a new line of sight. In stereoscopic vision, the angular difference between the lines of sight of the two eyes when fixed on the same object at a distance closer than infinity. The brain renders three-dimensional images by interpreting the parallax between your two eyes. The parallax becomes a distance — a greater distance if the angle is narrower. Parallax makes stereoscopic viewing possible. Another term we needed — this time to describe the region directly visible only if you move your eyeball centers significantly off the viewer optical axis, an action normally not possible in HMD's, but common with tabletop viewing. pl. pinnae Anatomy. The external part of the ear; auricle. Predecessor of LEEP Systems. Owned by Eric Howlett, Pop-Optix originally manufactued devices that automatically shut down computers when they overheated. In the 1980's they expanded into the realm of wide-angle photography with the LEEP Optics. "Outfitters for Otherworlds." The sense of being there. Presence is satisfied both visually and aurally by Videowrap. A set of rules and patterns our minds begin creating before birth. Reality predicts the way in which our actions and our perceptions will affect our senses. A measure of the degree to which details can be rendered. Properly used for an HMD, this measure would be given in pixels per degree, but it has come to mean the total vertical and horizontal pixel count of a bit-map image, a number that has to be converted to angular resolution by introducing the magnification at which it is viewed. At the current state of the art, wide-angle head-mounted displays have a very poor resolution. Videowrap can change all that. From the greek for "solid". Viewed from two slightly separated points so that parallax permits the object to appear solid and separated in depth. Humans and higher animals with two eyes in the front of their heads exhibit an exquisite sense of the third dimension. 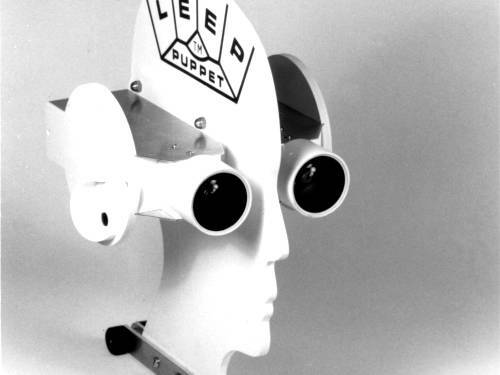 The dummy head with two video camera "eyes" and microphone ears for stereoscopic sight and binaural sound. It represents the Cyberface wearer's telepresence in any real (remote or recorded) Otherworlds. The perception of presence in a real place and/or time other than that in which the user actually exists. It's just like being there! The next generation of Virtual Reality technology. Videowrap does away with the limited field of view in today's HMDs and only restricts the user's field of view to the boundaries of his skull — as in real life. Although geared at first toward video games, its practical applications are boundless. Coined by Jaron Lanier, then president of VPL, the first private company devoted exclusively to the technology. The word "virtual" comes from the Latin for "character". VR is method of interfacing to Cyberspace that shares many characteristics with interfacing to actual reality. Generally, VR entails the display of a stereoscopic wide field of view such that users perceive themselves to be on the inside of a world that has no tangible existence anywhere in reality. Conventional monitors, no matter the size, can never yield this result. if you look away, the world vanishes. To give a full FOV, the whole solid sphere of Cyberspace must be rendered on the inner wall of some sort of room or on the inside of an HMD. Most HMDs fail to create a convincing VR experience because their limited field of view introduces a frame around the image. Neither the actual world nor Videowrap suffer from this visual limitation.